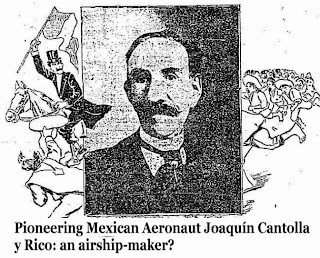 Inexplicata-The Journal of Hispanic Ufology: A Mexican Airship in 1900? Scholars of ufology are well aware of the "Airship Flap" of the late 19th century, studied by Jerome Clark and Lucius Farish and covered extensively in Robert Emenegger's "UFOs: Past, Present and Future" and Ralph & Judy Blum's "Beyond Earth". The presence of bizarre dirigibles or blimps, some of them reminiscent of Jules Verne's Robur the Conqueror's flying fortress, constitutes one of the most interesting high-strangeness periods preceding the onset of the modern UFO age. The photo shown above depicts a Mexican airship with conflicting dates: one source claims 1900 (www.skyscrapercity.com) and another 1907 (Instituto Nacional de Estudios de las Revoluciones de Mexico). 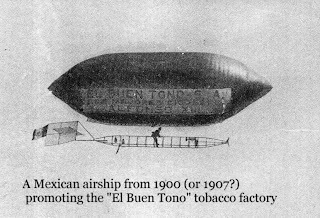 The artifact was a promotional vehicle for a long since vanished tobacconery, "El Buen Tono", which existed in the area presently occupied by Mexico City's Mercado de San Juan. Was this unsafe contraption created by the Mexican balloon-maker Joaquin de Cantolla y Rico, who was making and flying balloons as early as 1853? Or was it in fact imported by Ernesto Puigbet in 1907 and piloted by an American, "the famous Mr. Hamilton", as suggested in Jose Villela's Breve Historia de la Aviación en México (1975)? The question is best left to aviation historians, but one may wonder if simple "airships" of this kind may have been responsible for at least some of the sightings of what Ralph Blum described as "The Great American Magical Mystery Airshow"?